Taken 1873-1879 Hobart Gaol Campbell St. 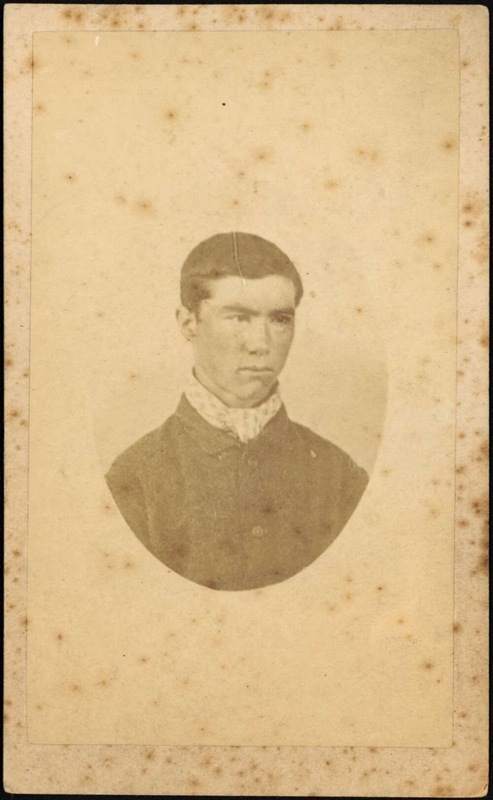 This is one of two extant duplicate photographs in carte-de-visite format produced by Thomas Nevin from his original glass negative taken of prisoner Philip Burton in September 1873. 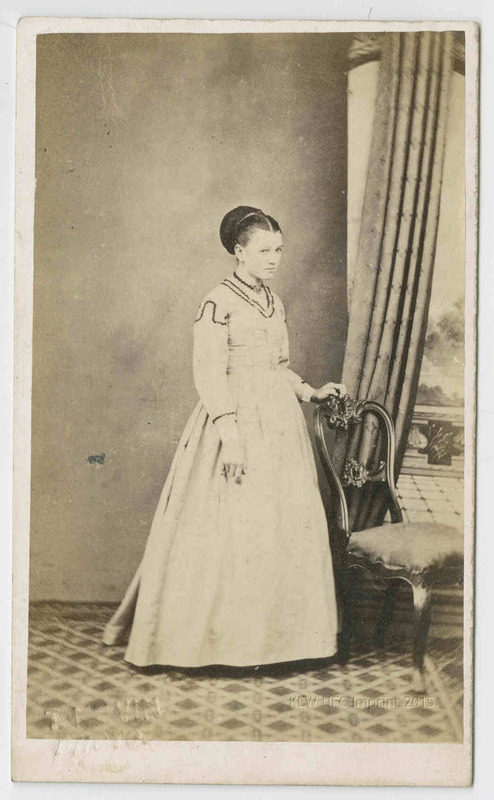 This cdv was originally held in the Queen Victoria Museum and Art Gallery, acquired from John Watt Beattie’s estate in the 1930s. When the QVMAG typed out a list of their collection in the 1990s, it was numbered as “131” and shown as missing from their collection, along with 126 more (one hundred and twenty-seven in total missing from a list of 199). It was returned – not to the QVMAG but to the TMAG – after being exhibited at the Port Arthur heritage site in 1983. The recto number was applied by the QVMAG, but the verso number “290” was applied ca. 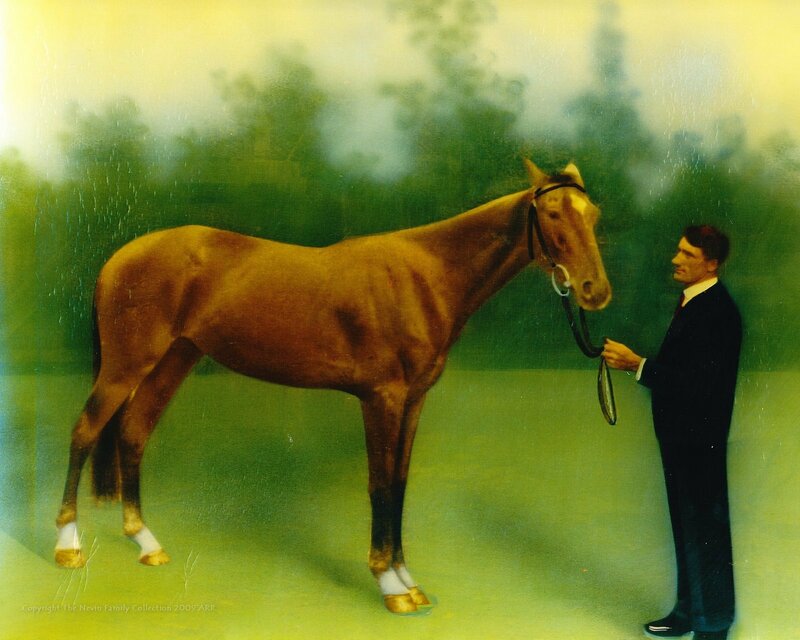 1915 when exhibited and offered for sale by John Watt Beattie at his museum in Hobart. 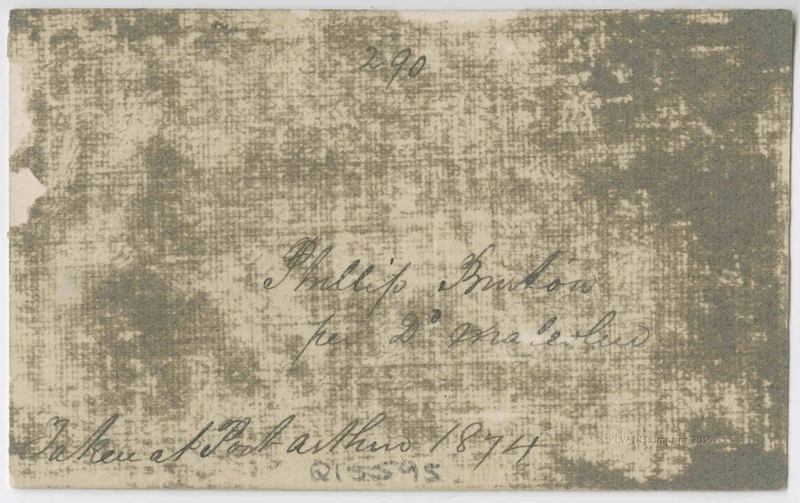 Verso: CDV of prisoner Philip BURTON taken 1873-1879 Hobart Gaol Campbell St. The National Library of Australia holds a duplicate (from Nevin’s original glass negative) of this same photograph, donated in the 1960s by Neill Gunson from government estrays (Sprod papers NLA MS 2320, 1964). 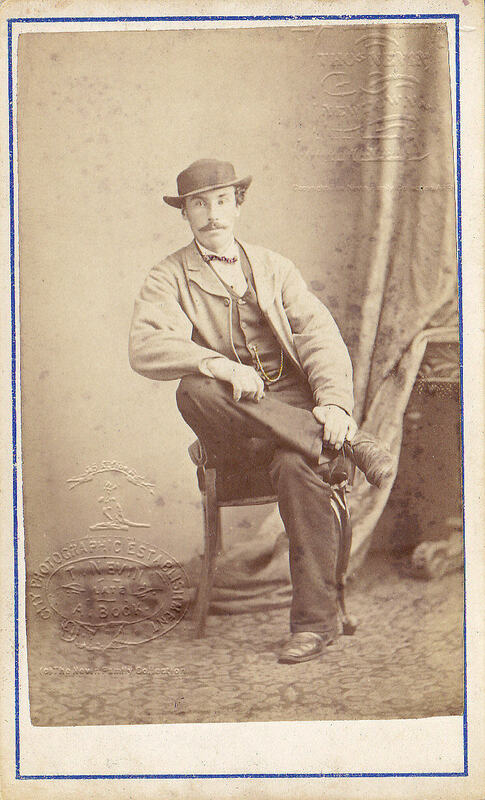 This cdv bears no numbering on the front but two sequential numbers on verso, “289” and “290”, an indication that they were a pair of cdvs which was split up and distributed from the original acquisition of Beattie’s collection at QVMAG after 1930. 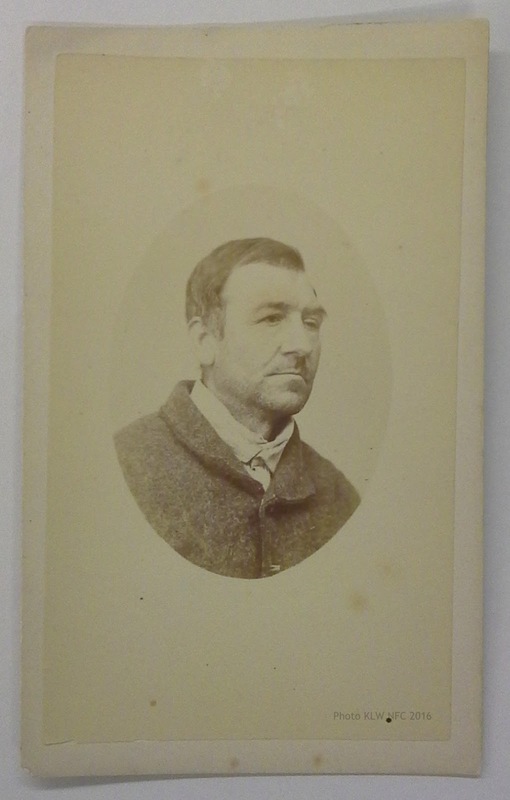 CDV of prisoner Philip BURTON taken 1873-1879 Hobart Gaol Campbell St.
Philip Burton was 43yrs old when he was sentenced to six years for assault and robbery in 1868. 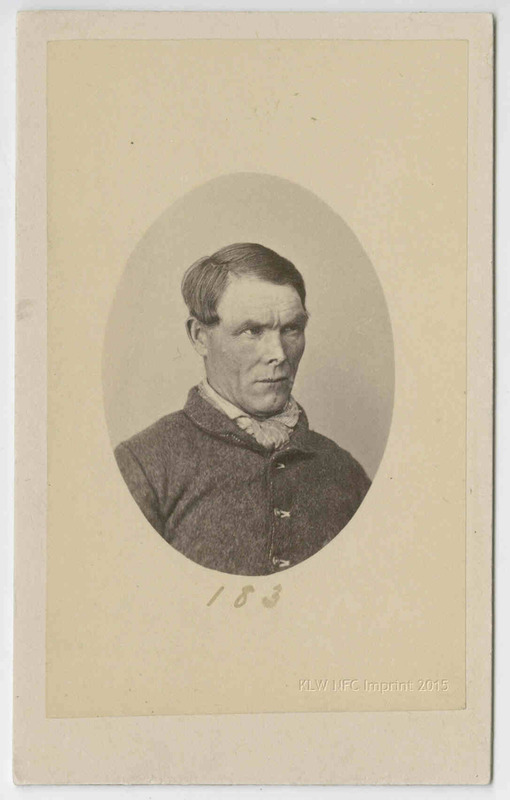 Philip Burton was charged on 14th April 1864 for assault and robbery, sentenced to 6 years, and discharged on 11th November 1868. Within 18 months, Burton was remanded for breaking and entering. Source: Launceston Examiner (Tas. : 1842 – 1899) Thu 11 Aug 1870 Page 5 POLICE COURT. 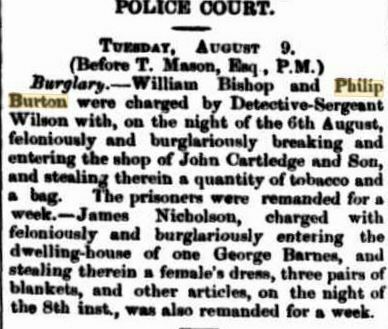 Burglary.-William Bishop and Philip Burton were charged by Detective-Sergeant Wilson with, on the night of the 6th August, feloniously and burglariously breaking and entering the shop of John Cartledge and Son, and stealing therein a quantity of tobacco and a bag. The prisoners were remanded for a week…. In 1873 he was sentenced to another lengthy term. once again for breaking and entering. Source: Launceston Examiner (Tas. : 1842 – 1899) Sat 30 Aug 1873 Page 3 THE RECORDER’S COURT. 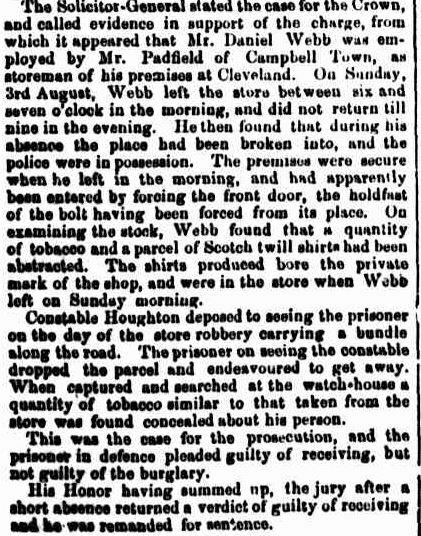 Philip Burton charged with burglariously breaking and entering the dwelling of Daniel Webb, of Cleveland on the 3rd August, and stealing twelve striped shirts, and 2lbs of tobacco, the property of F. A. Padfield, of Campbell Town. The Mercury gave a fuller account of how Philip Burton evaded a charge of burglary by dropping the bundle he had stolen from Padfield’s store before being apprehended by Constable Houghton, pleading guilty in court to the lesser charge of “receiving”. Source: The Mercury (Hobart, Tas. 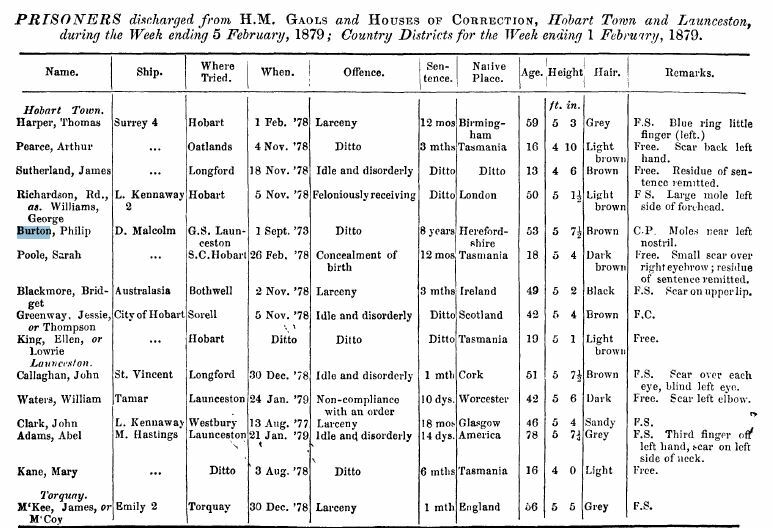 : 1860 – 1954) Wed 3 Sep 1873 Page 3 RECORDER’S COURT, LAUNCESTON. Source: The Tasmanian (Launceston, Tas. : 1871 – 1879) Sat 6 Sep 1873 Page 3 RECORDER’S COURT, LAUNCESTON. Henry Cavanagh was not sent to Port Arthur, as the verso transcription claims. His name does not appear in the House of Assembly Journals, Nominal Return of Prisoners sent to Port Arthur since its transfer to Colonial Government in 1871, tabled in Parliament on 11th June, 1873. 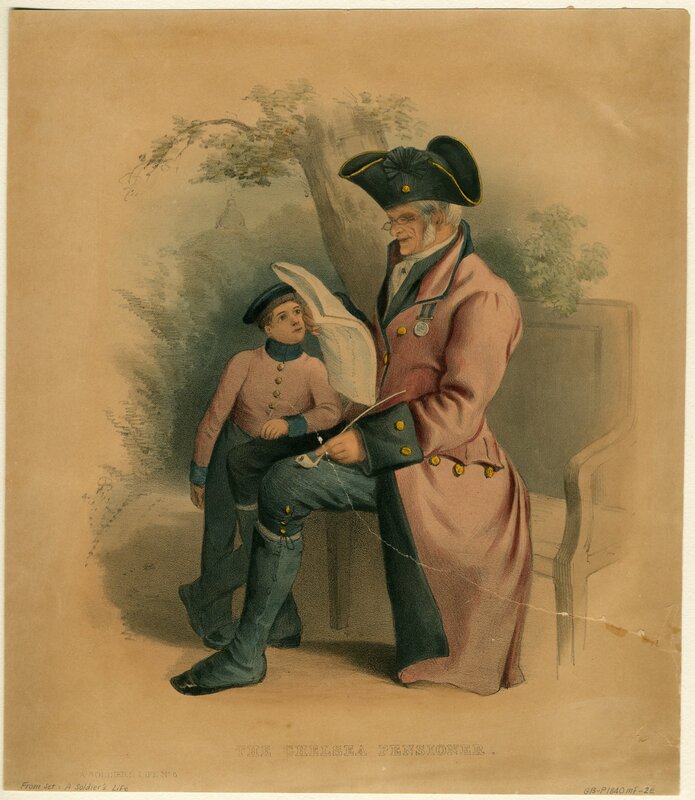 He was discharged before that date, on the 14th June 1872 after sentencing of one month in Hobart, and arraigned in Launceston nine months later, on the 3rd September 1873. 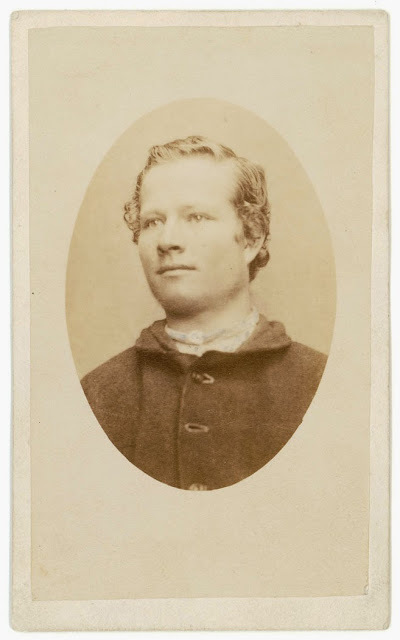 He was received at the Hobart Gaol, sentenced to 6 years, and photographed there on 17th September 1873 by T. J. Nevin. 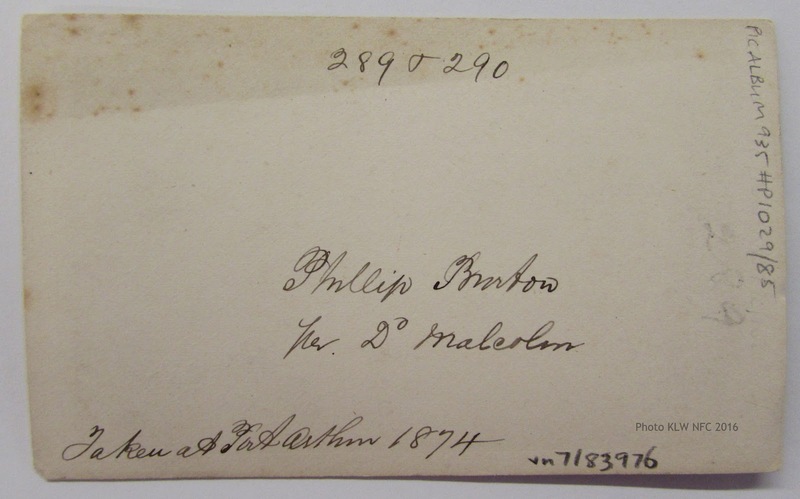 The numbering on the verso of this carte-de-visite, according to the NLA notes is “306”. This is an archivist’s number which would date from ca 1916 when sourced from Beattie’s Museum for the travelling exhibition on board the convict hulk, Success. 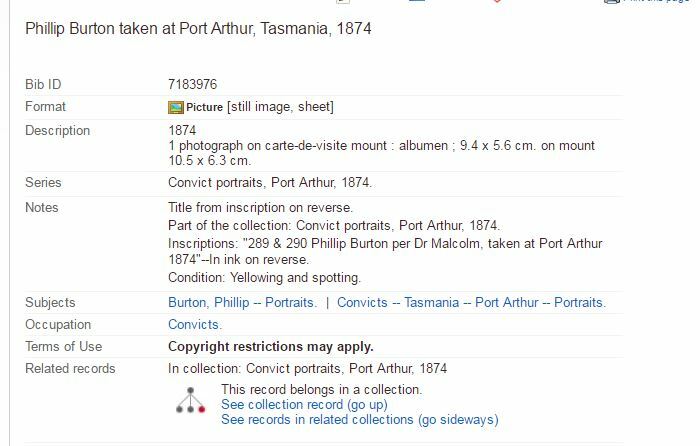 The transcription “Taken at Port Arthur 1874” was added at that time to encourage local and intercolonial tourism to the ruins of the Port Arthur prison site. More numbering was added in 1938 when the QVMAG exhibited more of these photographs from their acquisition of Beattie’s collection, perpetuating the spin for the tourist that the men in these photographs were “Port Arthur convicts” rather than ordinary habitual criminals which was the mundane reality when they were photographed at the Hobart Gaol on arrest, sentencing and discharge. 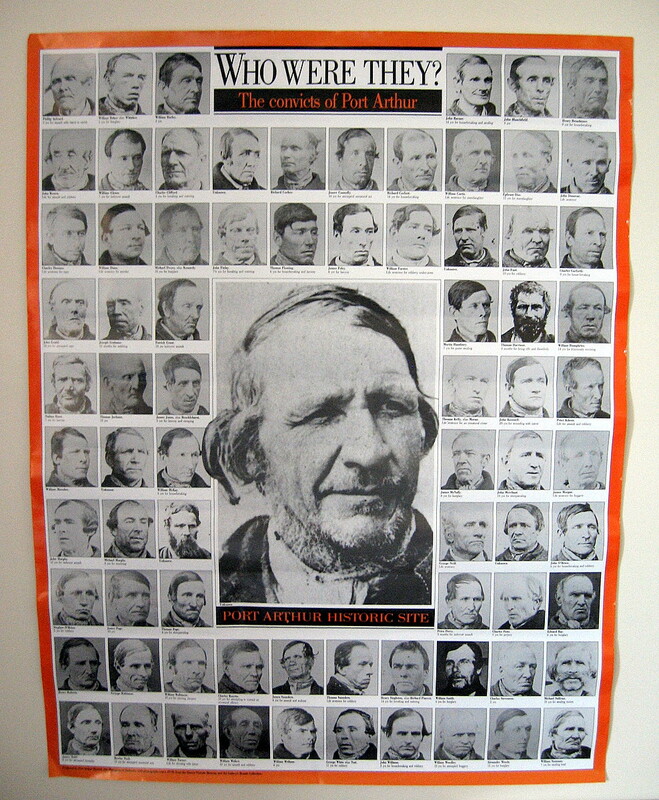 Further numbering on these CDVs dates from the 1960s with the donation of 87 CDVs of Tasmanian prisoners by Neill Gunson from Benevolent Society estrays to the National Library of Australia, and more numbering again appeared on both front and back of these CDV mugshots when the QVMAG broke up the Beattie collection and distributed more than 70 (seventy) for exhibitions in the 1980s at Port Arthur, and the National Portrait Gallery Canberra. 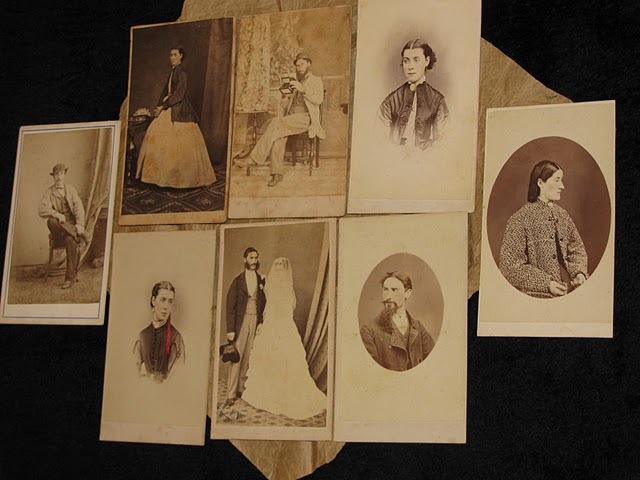 The majority of these copies and duplicates from the QVMAG’s collection of Nevin’s original glass negatives taken in the 1870s were returned to the TMAG; many were copied for the Archives Office of Tasmania, and some surfaced in private collections. 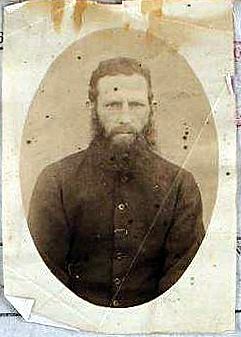 Philip Burton was discharged from the Hobart Gaol on 5th February, 1879. 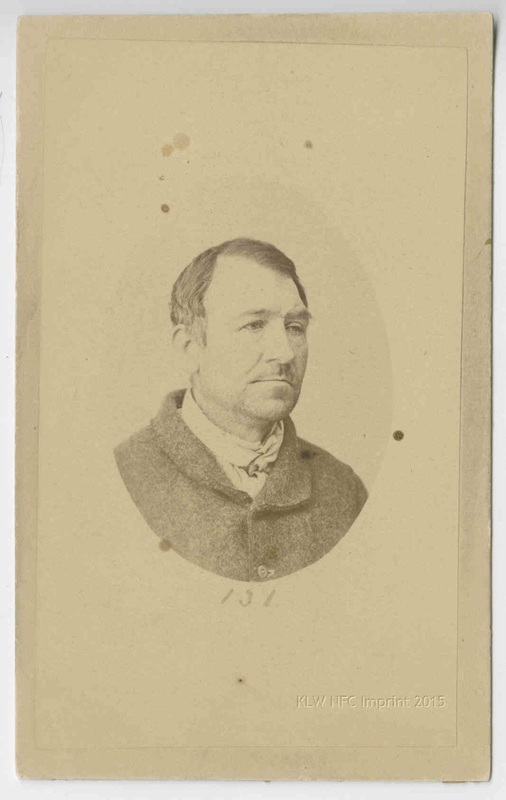 Joseph James Cooper, photographed by T. J. Nevin on Cooper’s arrest, unshaven, in the grey uniform he wore when brought up from the gaol for his arraignment at the Supreme Court on 4th March 1879, on the charge of forgery. Source: KLW NFC Group 2015 and the Port Arthur Historic Site Resource Centre. FORGING AND UTTERING. – Joseph James Cooper and Charles Fyshe, were brought from the gaol in the Government clothing, the former charged with having on the 29th day of January, uttered a forged order for £58 16s, with intent to defraud, and the latter with having forged an order for £65 10s 6d with a similar intent. The facts of this case have already been made public, the prisoner Cooper, who was employed in the Botanical Gardens, having taken an expedition to town in the afternoon of the day mentioned, and passed the forged order on Mr. Robb, the sadler, of Elizabeth-street. He also endeavoured to pass the other order at Mr. Walch’s shop. The greater part of the evidence against the prisoners was taken on Friday last. Cooper yesterday again cross-examined the witnesses as to matters of detail, and incautiously evinced a knowledge of the interior of Colonel St. Hill’s house, that was startling. The following additional evidence was taken. Thomas Harper, a fellow prisoner of Cooper’s who lent him the pair of spectacles, on the day he went to town…read the article here from the Mercury, 20th February 1879.